On Aug. 23, 1993, in the course of the military aggression of the Republic of Armenia against the Republic of Azerbaijan, the Fuzuli and Jabrayil districts, outside the former Nagorno-Karabakh Autonomous Region of Azerbaijan, were occupied by the armed forces of Armenia, said Hikmet Hajiyev, spokesman of the Azerbaijani Foreign Ministry in a statement on the 25th anniversary of the occupation of Fuzuli and Jabrayil. The history of the Zangezur region, the pogroms organized by Armenians in that territory, the actions of Garegin Nzhdeh and the true causes of the Armenia-Azerbaijan Nagorno-Karabakh conflict are presented in a distorted form in the article titled as "In the shadow of war: Life in Armenia’s defensive corridor", published by the New York-based Eurasianet.org on June 22. Baku will host a meeting of the International Contact Group (ICG) on Afghanistan June 28, Hikmet Hajiyev, spokesman of Azerbaijan’s Foreign Ministry, told Trend June 25. As a result of the Armenian occupation, Azerbaijan has become one of the countries with the largest number of refugees per capita, Spokesman for Azerbaijan’s Foreign Ministry Hikmat Hajiyev said in connection with the World Refugee Day observed on June 20. There are no Azerbaijani citizens among the victims of the earthquake in Japan, Hikmat Hajiyev, spokesman of Azerbaijan’s Foreign Ministry, said June 18. Azerbaijan is ready for substantive negotiations with Armenia to achieve progress in the settlement of the Armenia-Azerbaijan Nagorno-Karabakh conflict, Spokesman for the Azerbaijani Foreign Ministry Hikmat Hajiyev said in Baku May 31. 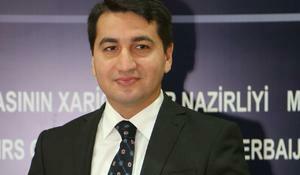 Military service by the citizens of Armenia in the occupied territories of Azerbaijan is a violation of the norms of international law, Azerbaijani Foreign Ministry’s Spokesman Hikmet Hajiyev told Trend May 27, commenting on the information about the military service of Armenian prime minister’s son in the occupied territories of Azerbaijan. Holding negotiations with Armenia for over 25 years is Azerbaijan's biggest compromise, Azerbaijani Foreign Ministry’s Spokesman Hikmat Hajiyev told Trend on May 22. Sputnik-Abkhazia reported that Raul Khadjimba, who presents himself as the "president" of Abkhazia, and Director of the Fourth CIS States Department at the Russian Foreign Ministry Alexei Pavlovsky met with representatives of the illegal regime established in the occupied territories of Azerbaijan, as well as Dnepr and South Ossetian regimes. Azerbaijan stands for intensive talks to move forward peace talks on Armenia-Azerbaijan Nagorno-Karabakh conflict, Azerbaijani Foreign Ministry’s Spokesperson Hikmat Hajiyev told Trend, commenting on the controversial reaction of Armenians to today's speech by Azerbaijani President Ilham Aliyev.